Next big thing?The game, with 16 overs per team, is usually played on an Astroturf court surrounded by a net. Another nail-biting, fast-paced cricket World Cup unfolded last week—but void of an Indian team and played indoors. Not the real thing, you say? The sports marketing industry wants you to think again. Until now, indoor cricket has largely been a cobbled-together affair here, played mostly by clubs and “state teams" who cannot make it to the big leagues. While a national federation organizes inter-state tournaments, matches seldom make headlines. But buoyed by the success of the brisk Twenty20 format and on the hunt for more innovations, sports organizers are hoping an indoor version of the game might find an audience—not to mention good players—in India after all. Percept D’Mark Sports said it plans to introduce indoor cricket for corporate houses next year and has begun preliminary talks with Action Cricket of South Africa, a subsidiary of the UK’s Action Indoor Sports, a league organizer of indoor sports from football to cricket, said chief operating officer Roland Landers. “You guys are nuts about cricket, I’m amazed there are no indoor facilities there," he said. Action Indoor owns the stadium where the World Cup was played last week. 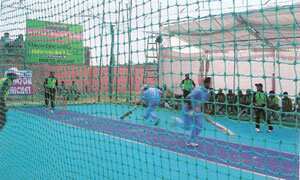 The game, with 16 overs per team, is typically played on an Astroturf court surrounded by a net. Each of the eight players has to bowl two overs each, while batsmen play four overs each. If a batsman is out, he continues though the team loses five runs. A batsman can get caught off the net. The match typically takes under two hours, and is played with a tennis ball with the casing of a regular cricket ball. Van Laun envisions “some kind of partnership" in India to start operations here that will include building stadiums to international specifications and running leagues. Next week, he’ll send a formal invitation to the Indian federation’s secretary general Mohinder Singh Khasa to visit Bristol for a first-hand review of facilities, and preliminary talks for a partnership. The Gohana, Haryana-based Khasa said the state government had promised him land for an indoor stadium, which could be utilized. But while he says he’s interested in a commercial partnership, the federation wouldn’t be involved in managing any new property. Gohana has two, while Patiala, Yamuna Nagar (also in Haryana), Nashik, Hyderabad and Puducherry have one each. A state-of-the-art indoor stadium, India’s biggest with 150,000 sq. ft, is being developed in Ahmedabad by Neo international Sports Academy. So it has not been entirely without a following in India, and an Indian team has been in World Cups in the past. But this year, the squad had to sit out the UK tournament because visas were denied. The most recent Cup marked England’s second, the inaugural tournament being held in Birmingham in 1995. Since then, Australia (men’s team) has lifted the trophy at home in 1998, South Africa in 2000, and New Zealand in 2002), with Sri Lanka emerging victors in 2004. Australia has won all four women’s tournaments so far—in 1998, 2000, 2002 and 2004. Australia, of course, also happens to boast 300 indoor cricket stadiums. The tiny New Zealand has 30, South Africa 29, and England 10. Yet, with compact cricket catching the fancy of the country, this could change. “India is a big market for cricket," said Khasa. “If we have one celebrity cricketer playing here, and I’m talking minimum, it’ll be big for us." Australian cricket stars such as Glenn McGrath are known to regularly play this form of the game, just as Brazilian footballer Ronaldo, who plays the five-a-side soccer game Futsal. Landers doesn’t rule other options, like tying up with an Australian company, or having its own property. “Instead of being a paying franchisee, we can own it individually," he said. “But we’ll pursue this genre of the sport."